In modern times, the American people have given new life to this grand public space in ways never imagined by past generations. President Washington had a hand in the founding of the capital with a monument to himself at its heart. Today the unformed expanse of the 60 acre Monument grounds shows little evidence of the ideas of the past. 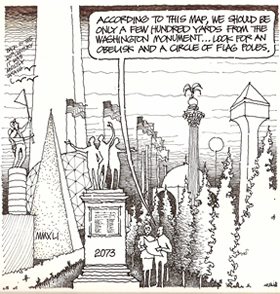 Critics complained during construction that a giant obelisk was the wrong symbol for America, and alternatives were proposed. The WAMO Competition gives us an opportunity to help shape the future with creative ideas. What are your ideas to make the grounds more welcoming, educational, and effectively used by the public? Earlier generations imagined a variety of designs for the Monument and its grounds. Can the Washington Monument grounds be made more welcoming, educational, and effectively used by the public?